beets – Damn, I Can Make That! Finally! We’re getting in to fresh produce season! Not that I mind all of the comfort food that fall and winter brings, but you just can’t beat a fresh homemade salad. And this one includes the perfect “cross-over” ingredients. You can mix together our lemon-y salad dressing, or make the dressing below. Set your broiler to high. Toss the quartered sweet potato in olive oil and a dash of salt. Spread it out evenly on a cooking sheet and stick it under the broiler until it begins to soften and brown, approximately 10 minutes. 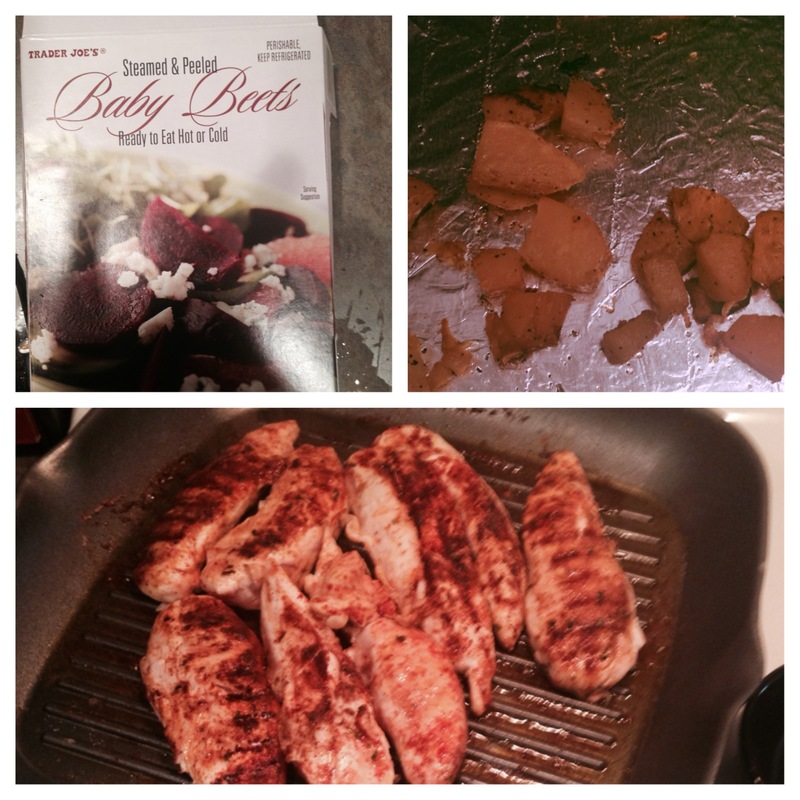 (This is the same way you can make sweet potato fries. Just cut them thin instead of quartered.) When the sweet potato is just about done, throw in the walnuts to get them warm and slightly toasted. 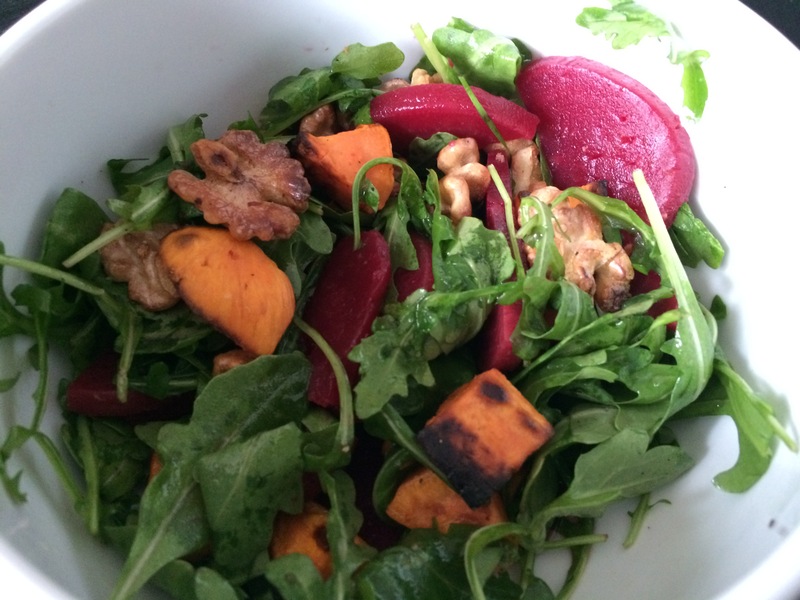 In a salad bowl, throw together the arugula, beets, and warm sweet potato and walnuts. Toss with the dressing and enjoy. Anyway, the other day I whipped up our fruit parfait for breakfast and made way too much quinoa. I couldn’t just throw it out so I got to experimenting. This is how it went down: Quinoa’s healthy, so what else is healthy? Hmm, throw in some cucumbers, beets for some color, kale of course, and fresh dill! (Only because I’ve acquired an obsession with it since the flies and swims recipe). Top it all off with the quinoa and you actually get a pretty filling salad. I also paired it with our homemade dill dressing (I told you, obsessed) and it was damned refreshing, perfect for spring. *Makes 1 personal sized salad. Toss together everything but the quinoa (I mean you can if you want to, but I prefer not to). 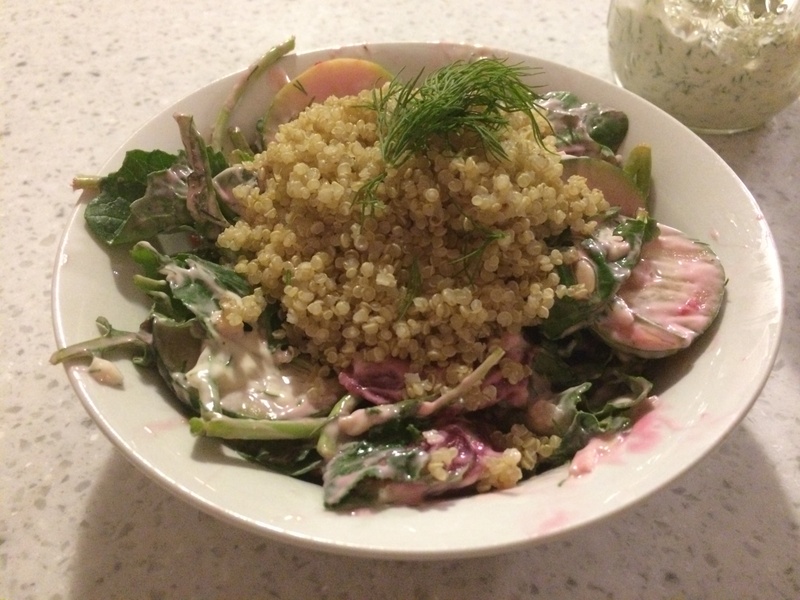 Once the dressing is evenly coated on the salad, top with the quinoa and garnish with a bit of dill.